IDA8 responds to Public Address and Voice Alarm requirements as stated in EN54-16, ISO 7240-16 and BS5839/8, with specific attributes for compliance in large installations. Ateis’ IDA8C Public Address and Voice Evacuation System is a controller unit that enables operators to see a detailed overview of the operational status of the entire PA system with a single push button. The IDA8C can store up to 1 hour of digital messages by providing live-recording or pre-recorded playback. External files can also be uploaded (WAV) from a computer into IDA8C. Up to 4 messages in a single IDA8C Controller unit or a total of 48 messages in an IDA8 system. The Controller unit (IDA8C) is able to run an impedance scan of all components connected to it, covering not only the input paging consoles but including connectors, cabling, processing blocks such as compressors and limiters, delay lines and the network and loudspeakers. 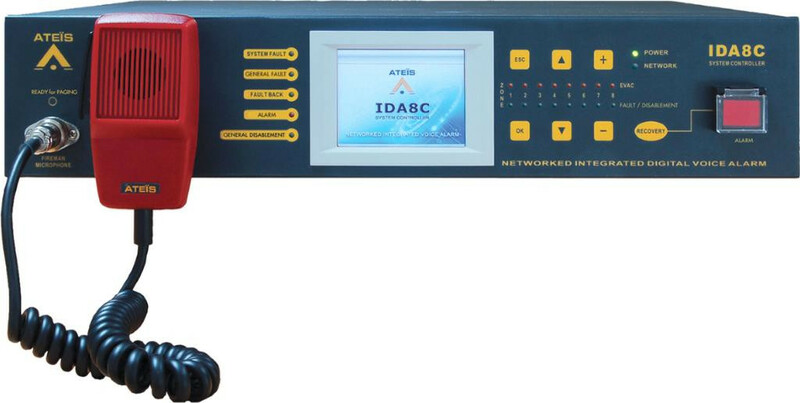 The IDA8C stores a reference measurement of the system as it exists in a given configuration and environment. This reference is stored in the system. Any changes to the references will be reported and are save in an event log file. The Controller unit can be configured with ATEÏS-Studio global software (Windows compatible) and it can be protected with a secure password. Once the software is programmed, the system will be able to work off-line without the need of a connected PC.